Students hold up a Relay for Life banner as participants prepare for the survivor walk, a lap around the track taken by those who have won their battles with cancer. Cancer survivors were honored during their victory lap and team captains were introduced for a team strut. The luminary ceremony, presented by Janene Fry, included lighting the luminary bags in honor of those fighting cancer and in memory of those that have lost the battle to cancer. Reading of names was by Jim Gardner and Jennie Long and guest speaker was Pat Gilbert, a cancer survivor. Ending the ceremony was a tiki torch lap, led by families and friends remembering loved ones lost to cancer in the past year. Awards for the night included most creative campsite, presented to Polka Dot Forget-Me-Nots, Soar Like An Eagle and Team Sara. Top fundraising individuals included Philip Wiederholt with $3,062, Teresa Knight with $2,700 and Rick Garvin with $2,670. Top youth fundraising individual was Lyndsey Heward with $500. Top fundraising teams included RJ’s Auction Service with over $5,000, All In The Family with over $4,000 and Polka Dot Forget-Me Nots with over $4,000. Fun and games continued throughout the night with music provided by J&L DJ Services. The most popular entertainment was the crowning of Queen of Relay. Six male participants, dressed as ladies, collected donations to determine the winner. The winning competitor was Queen Petunia from Harmon’s Tooth Fairies, with $130 in votes. 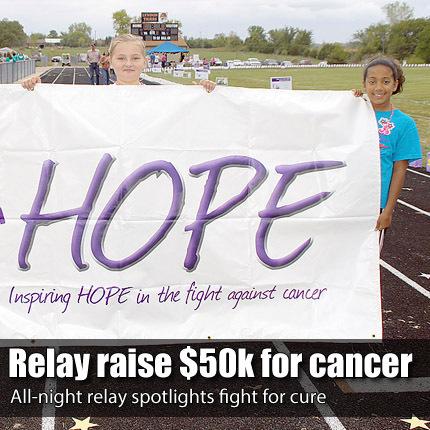 The contest helped to raise an additional $600 toward the Relay for Life event. The event ended with a prize drawing for those who had stayed the entire night and awards were presented to teams for their fundraising achievements. The Relay for Life committee and team captains will attend a wrap-up meeting 6:30 p.m. Oct. 9 to discuss the success of the event. To be a part of the committee for Relay for Life, contact Julie Trout at (785) 608-8732.